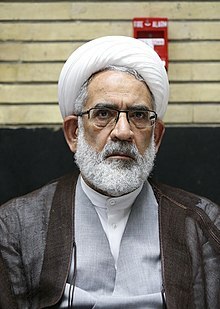 Mohammad Jafar Montazeri (Persian: محمدجعفر منتظری‎; born 1949 in Qom) is an Iranian cleric and judge and the current Attorney-General of Iran since 1 April 2016. He was previously head of Iran's Administrative Justice Court and Special Clerical Court. ^ "عضو جدید جامعه روحانیت مبارز معارفه شدند". Islamic Republic News Agency (in Persian). 23 August 2016. Retrieved 13 September 2016. This page was last edited on 30 December 2018, at 16:29 (UTC).